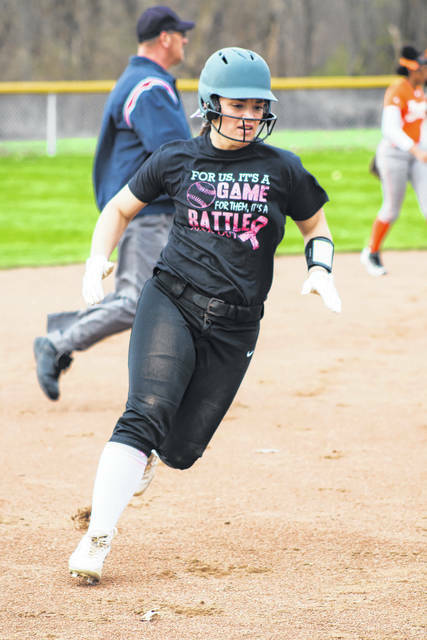 GALION — Galion beat Mansfield Senior 19-0 Friday in the Tigers’ annual Strike Out Cancer game. It was Galion’s seventh straight win and ups their record to 9-3 overall, 3-3 in Mid-Ohio Athletic Conference play. Galion got five runs in t he first and never looked back. It was 14-0 after two innings. Gabby Kaple got the nod in the pitcher’s circle, worked all five innings, walked one, fanned 10 and gave up one hit. At the plate, she ripped four singles, with two RBIs and scored three times. Kate Schieber and Nevaeh Clark had three-hit apiece. Schieber had three singles and three RBIs. Clark belted two triples, a double and also had three RBIs. Emily Sedmak, Gracie Groves, Natalee Perkins and Teanna Greter net two hits apiece. Sedmak ripped a pair of singles, scored a run, drove in two runs and swiped a base while Groves knocked a single, a double, scored a run and swiped a bag. Perkins also had a pair of singles, two RBI and two runs scored with Greter finishing with a single, a double, two runs scored and a run batted in for the freshmen duo. In total, the Lady Tigers plated their 19 runs on 20 hits and stranded just three runners on the base path. Galion played a spotless game in the field. Other offense for the Tigers came from: Hailey Hunter- 1B, R, RBI; Kennedy Gifford- 1B, R, RBI; Kayden Caudill- R, RBI; Maddie Harmon- R, SB; Madelyn Thomas- 2RBI and Kylie McKee- R.
Galion was on the road in Bellville against the hosting Clear Fork Lady Colts on Tuesday and will host them at Klehm Field on Wednesday. On Thursday afternoon, the Lady Tigers will head to Marion for a non-conference meeting with the Elgin Lady Comets. GREENWICH — On Saturday, April 13, the Lady Golden Knights from Northmor made the bus trip to Greenwich to clash with the hosting South Central Lady Trojans for a non-conference doubleheader. In game one of the double-dip, it would be the hosts claiming the victory in walk-off fashion; 4-3 in eight innings. South Central reached the scoreboard first, plating two in the bottom of the opening frame before Northmor was able to cut the lead in half in the top of the fourth. The Trojans extended their lead to 3-1 after a run in the home half of the fifth. Not to be outdone, the Knights plated two in the seventh to push the game into extras, only to see South Central walk-off with two outs in the inning. Megan Adkins started the game in the circle for Northmor and went five innings, giving up six hits and three earned runs while walking four and striking out four. Rylee Hollingsworth would be handed the loss after pitching the remaining 2⅔ innings, giving up the lone hit and run while walking one. Northmor managed just three hits in game one and left five runners stranded while committing four errors in the field. South Central recorded seven hits, stranded 10 and had three miscues. Aly Blunk knocked a double and drove in two runs while Morgan Wiseman also belted a double. Lily Tate delivered a solo home run on the day while Aliyah Martinez and Joycianne Cooper scored the remaining two Knights’ runs. Game number two proved to be quite a different story as Northmor cruised to a 12-1 victory in five innings. With the win, the Lady Knights improved to 2-11 overall on the season. Hollingsworth went the duration in game two, scattering four hits and allowing an unearned run and striking out three. Hollingsworth had a more potent offense behind her as Northmor plated their 12 runs on 11 hits. Adkins, Cooper and Rosie Sklenicka led the way at the plate for the Golden Knights in game two. Adkins belted another home run while also recording a single en route to three runs batted in and three runs scored. Cooper notched two singles, a run scored and a run batted in in the victory. Sklenicka finished with a single, a double and a run scored. Other offense in game two came from: Blunk- 1B, R, RBI; Wiseman- 1B, 2R, 2RBI; Tate- 1B, 2R; Martinez- 1B, 2RBI and Michalea Zeger- R.
The Lady Knights will be back in conference play on Tuesday when they travel to Mount Gilead to clash with the hosting Lady Indians. On Wednesday, Northmor will host Mount Gilead in a contest that was originally scheduled for Monday, April 15. GALION — Back on Friday, April 12, Northmor played host to East Knox for game two of their season series. The Lady Knights held a big, 8-2 lead early but the Bulldogs would plate six in the fourth to tie the contest up. East Knox would add two runs in the fifth, sixth and seventh en route to a 14-12 victory. Northmor sits at 0-8 in the Knox-Morrow Athletic Conference. The visitors scored their 14 runs on 18 hits, stranded 10 runners on and committed just one error in the field. The Knights scored 12 runs on 13 hits, left seven on base and finished with five miscues on defense. Adkins took the loss in the circle, going 4⅓ innings and giving up 12 hits and 10 earned runs while walking two and fanning three. Hollingsworth finished the game off, allowing six hits and four runs (two earned) in 2⅔ innings pitched. Tate finished the game with four hits in four at bats including two home runs and two singles. Tate racked up four runs batted in and four runs scored in the loss. Other offensive statistics for the home team were: Maddie Hoverland- 2-1B, 2R; Blunk- 2B, R; Adkins- 2B, HR, 2R, 3RBI; Hollingsworth- 2R; Wiseman- 1B, R, RBI; Cooper- 1B and Sklenicka- 2-1B, 3RBI. 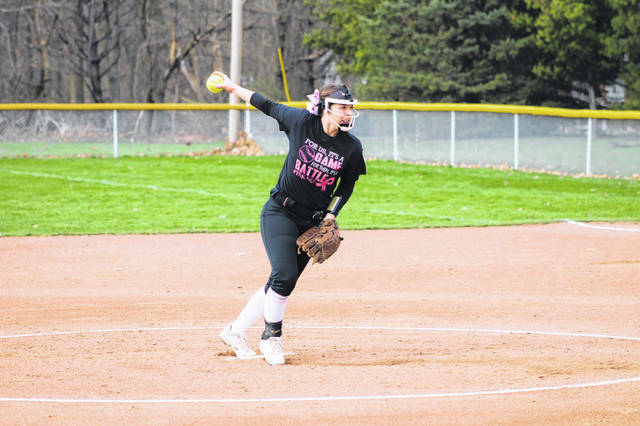 CRESTLINE — On Friday, April 12, the Crestline Lady Bulldogs welcomed the Buckeye Central Buckettes to their home field for a non-conference softball clash. Offense would not be lacking for either team and when all was said and done, it would be the Lady ‘Dogs coming away with the victory by a final tally of 21-17. With the victory, Crestline moves to 4-7 overall on the season and currently sit at 2-2 within the Mid-Buckeye Conference. The Bulldogs would plate their 21 runs on 26 hits and still left eight runners on the base path for the game. For Buckeye Central, they would score 17 runs on 13 hits while stranding 15 on the bases. Buckeye Central took a 5-0 lead into the second before they would tack on an additional five runs to head back out on defense up big at 10-0. Crestline would take a large chunk out of that lead though, scoring seven in the home half. In the third, the Buckettes stretched their lead to 11-7 before the ‘Dogs plated four in the inning to tie the contest up. In the fourth, neither team would find the scoreboard and the Buckettes would add two in the fifth. Crestline proceeded to have their biggest inning of the game in the bottom of the fifth, scoring nine runs to take the 20-13 advantage. Buckeye Central scored their final four runs in the sixth before being blanked in the sixth. Pitching statistics for the Bulldogs in the win were: Ivy Stewart- IP, 4H, 5ER, 3BB, K; Brynn Cheney- 2IP, 4H, 6ER, 7BB, 2K; Desi Neveja- 2IP, H, 2R (1E), 2BB; Alandra Tesso- IP, 4H, 4R (2E), 3BB and, earning the victory, Bri Briggs- IP, 2BB. Stewart and Cheney both recorded four-hit games for Crestline in the win while Neveja, Tesso, Lauryn Tadda, Emma Kirby and Destiny Hoskinson all racked up three hits apiece. Stewart finished with four singles, four runs scored and three steals while Cheney knocked three singles and a home run, drove in four, scored three times and had a steal. Neveja netted two singles, a double, three runs scored and two driven in while Tesso knocked a pair of doubles, a single, scored a run, drove in four runs and swiped a bag. Tadda finished with a pair of doubles, a triple, two RBI, three runs scored and a steal. Kirby recorded two singles, a double, two runs scored and an RBI while Hoskinson ripped three singles while driving in two and scoring twice. Briggs also had a multi-hit game, belting a single, a home run, driving in three runs, scoring two runs and swiping a base. Abbey Reed rounded out the offensive explosion for Crestline, delivering a single, a run batted in and a run scored. The Lady Bulldogs will be on the road against MBC foe, the Loudonville Lady Redbirds, on Tuesday before playing host to their rivals on Wednesday. On Friday, April 19, Crestline will be on the road at New London in non-conference action. The Lady Eagles from Colonel Crawford dropped their home, non-conference meeting with the visiting Willard Lady Crimson Flashes on Saturday by a final score of 4-1. With the defeat, Crawford falls to 4-9 overall on the season. Back on Friday, April 12, Crawford defeated Northern-10 Athletic Conference foes, the Wynford Lady Royals by a final score of 10-5. With the victory, the Eagles earned the season series sweep and improved to 3-5 in conference play.